This new handbook will be an essential resource for ceramicists. 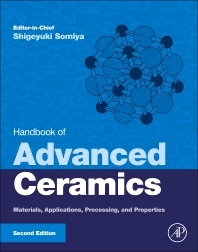 It includes contributions from leading researchers around the world and includes sections on Basic Science of Advanced Ceramics, Functional Ceramics (electro-ceramics and optoelectro-ceramics) and engineering ceramics. 1 What is Electric Discharge Machining? 2 What is a Mold? Chapter 11.1.1. Ceramic Powders for Advanced Ceramics: What are Ideal Ceramic Powders for Advanced Ceramics?